On September 5 on the occasion of The Day of businessman the best representatives of business area were congratulated and awarded in Kharkiv Opera and Ballet theatre. Among them there was Irina Obydenkina, the director of Audit and Consulting Corporation “Global Consulting”. On September 5 the businessmen of Kharkiv were congratulated on the occasion of professional holiday. The event was held in Kharkiv National N. Lysenko Opera and Ballet Academy Theatre. 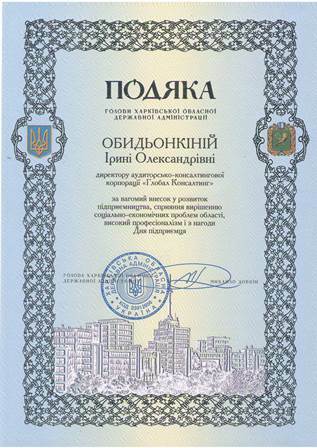 During the celebration the best businessmen were awarded with Diploma of City Council Executive Body. The director of “Global Consulting” Corporation was awarded with testimonial from the Head of Kharkiv Regional State Administration for the weighty contribution to developing of business, solving social and economic problems and high professionality. The representatives of city authorities came to congratulate the businessmen. They pointed out huge contribution of the businessmen to the development of economy and contribution to the solving of social problems of the city. “Global Consulting” Corporation also congratulates the businessmen with their professional holiday. We wish you energy and moderation, success, profitability and prosperity of the business.